If you have noticed numerous third-party adverts, annoying pop-ups, and suspicious coupons while browsing the web, it is likely that your PC is infected with an adware application known as SaverExxtensIon. Do not hesitate to remove this invasive adware program as it could have devastating outcomes if left unattended. Many unsuspecting users are tricked into installing SaverExxtensIon as it sounds tempting to have an application on your PC which could save you money and time while shopping online. The truth is that SaverExxtensIon is an utterly useless and potentially harmful application that should not be trusted under any circumstances. Use the removal guide to get rid of SaverExxtensIon as soon as possible. Research has revealed that SaverExxtensIon is closely related to adware applications such as RealDeal, RightCoupon, LuckyCoupon, SaveNShop, and many others. Thus it was noticed that SaverExxtensIon is distributed in a similar way as its counterparts. In most cases this invasive applications is mostly bundled with installers such as Amonetize, InstallRex, and Vitallia. All of these installers are mostly hosted on various questionable third-party download websites, so if you want to reduce the risk of getting your PC infected, download software from official vendors’ websites only. Of course your best bet to maintain a clean, secure, and fully functioning system is to protect it with a professional malware detection and removal tool. 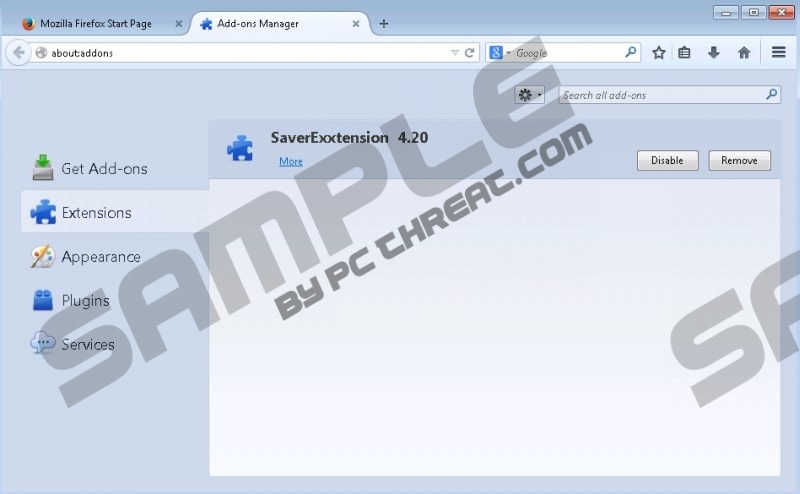 SaverExxtensIon functionality does not differ all that much from other adware applications, since it depends on browser extensions to display third-party advertisements and annoying pop-ups. SaverExxtensIon will implement extensions to Mozilla Firefox and Internet Explorer; at the moment Google Chrome is not affected by this invasive application. Numerous pop-ups and adverts will make browsing the web an annoying and frustrating experience. What is even worse is that SaverExxtensIon could serve as a gateway into your PC for other Internet-based infections. Often adware applications are able to update themselves; by conducting such updates SaverExxtensIon could download potentially harmful applications along with it. Do not risk getting your PC infected with an unknown infection, and remove SaverExxtensIon as soon as it is discovered running on your PC, as that is the only way to restore maximum security of your operating system. Fortunately, the removal of SaverExxtensIon is quite simple, as you can delete SaverExxtensIon via Control Panel. However, it has been noticed that some traces of the infection often remain on the computer even if manual removal was conducted. That is the reason we firmly recommend scanning your PC with a reliable antimalware tool after manual removal is executed. Right-click SaverExxtensIon and select Uninstall. Select SaverExxtensIon and click Uninstall. Quick & tested solution for SaverExxtensIon removal.